Objectif: One (or more) big flight(s). The first two or three days are spent on the training hill. You learn how to inflate your glider, to run with it above your hear and how to control it. And then, slowly, you'll go for your first launchs and little fligths. Next days are for the big flights (according the weather forecast). You ll launch from one of the Aurel's site in calm condition. One instructor will be on the launch and another will be at the landing zone. You are equipped with a radio and in constant contact with the monitors. Everyday, there will be a theorical course, simple to answer your questions and to link the experiences of the day. Flight mechanics: why does it fly ? Aerology, Meteorology: winds, clouds ? regulations: Where can i fly ? what should i need to fly ? At the end of the course, you ll have fly one or more big flights and you ll be able to fly solo supervised by instructors. The next step will be a progression course or a full package course to become a pilot. If the weather is not good for flying then days are rescheduled or refunded. 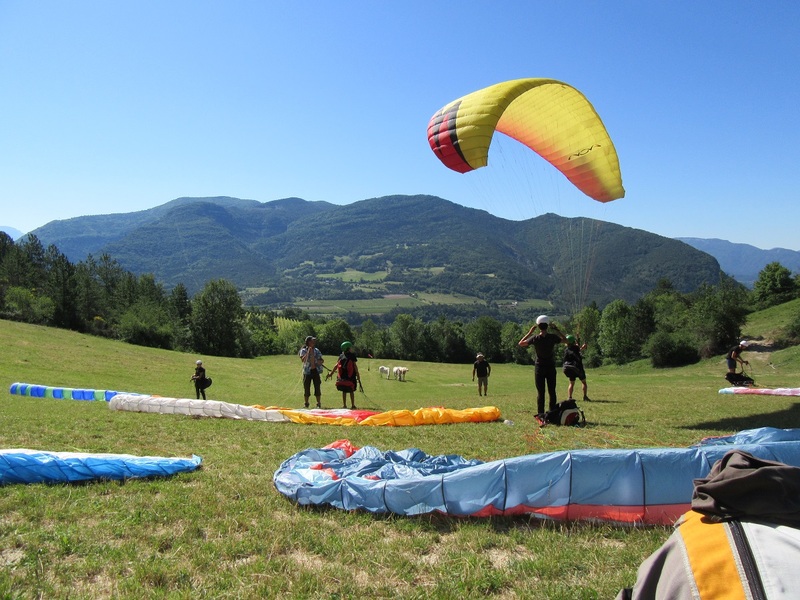 Price: including teaching, paraglider and shuttles. Objective: To acquire a solid foundation for your pilot life. Objective: increasing your flight skill, for safety and performance, so that the flight is always "fun".